Need better inventory, order management, and manufacturing than you get with QuickBooks Online? Get sales orders, assemblies, serial inventory, multiple locations and more, all at a fraction of the cost of traditional manufacturing systems. SOS Inventory is the #1 inventory and manufacturing add-on for QuickBooks Online (QBO). Peak Advisers is a Certified Implementer of SOS Inventory. SOS (Saddle Oak Software) released its QuickBooks Online solutions is 2009. Integration with Shopify, ShipStation, UPS, PayPal, and more allows for quick and seamless processing of orders. Use automated order processing to create automatic shipments, set priorities, notify workers, or anything else that suits you. Reports allow you to understand what you have, where it is, and what you need to order. Alerts can email or text you when your attention is needed. With SOS Inventory, you'll be organized and efficient. 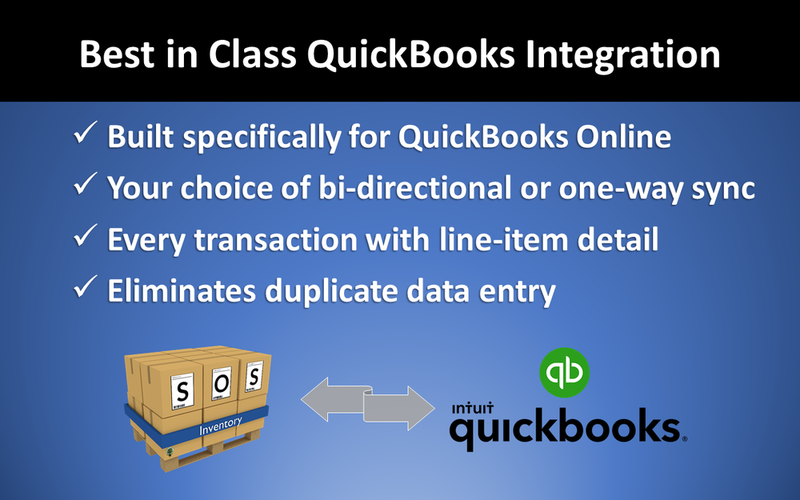 SOS Inventory’s most compelling feature is its tight integration with QuickBooks Online. We specialize in QuickBooks Online. It’s not an afterthought for us. Our software is built for QuickBooks Online from the ground up. We know what is possible with QuickBooks Online and what is not, and we’ve built our software to save you time and money by reducing duplicate data entry. The time (and thus money) that your staff saves by using our software goes directly to your bottom line.